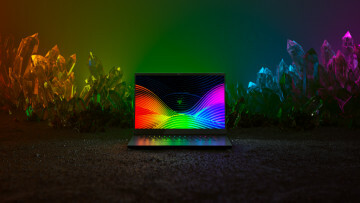 For a long time, Intel's graphics drivers have come bundled with the company's Control Panel, which allows users to adjust a variety of display and video-related settings. Now, the company has come to the realization that the interface for that control panel isn't the easiest one to understand and is introducing a new solution for that purpose. The Intel Graphics Command Center is a new app available on the Microsoft Store, and therefore exclusive to Windows 10, that tries to offer the same capabilities as the traditional control panel in a package that's easier to understand. 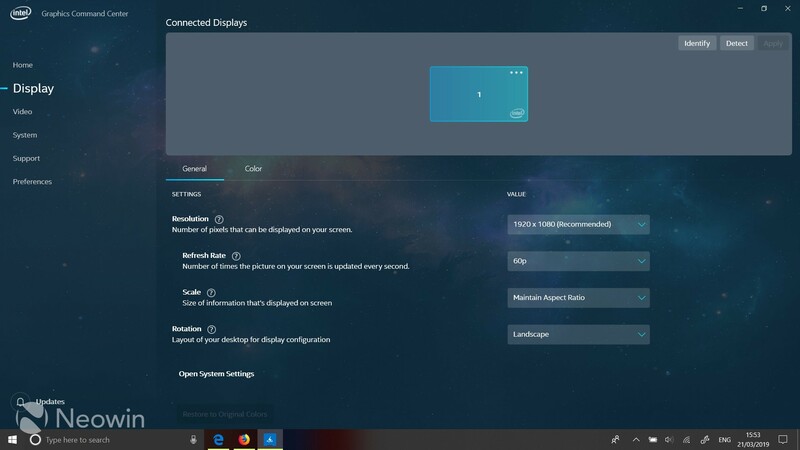 In terms of visuals, the app offers an interface that will feel very familiar to Windows 10 users, with XAML UI elements and Fluent Design, including the Reveal lighting effects and Acrylic material (which can be enabled under "Preferences"). Furthermore, Intel has also simplified access to many of the features of the control panel. Game optimization is done directly through the home page, multiple monitors are easier to set up and configure instead of having a separate dedicated page. 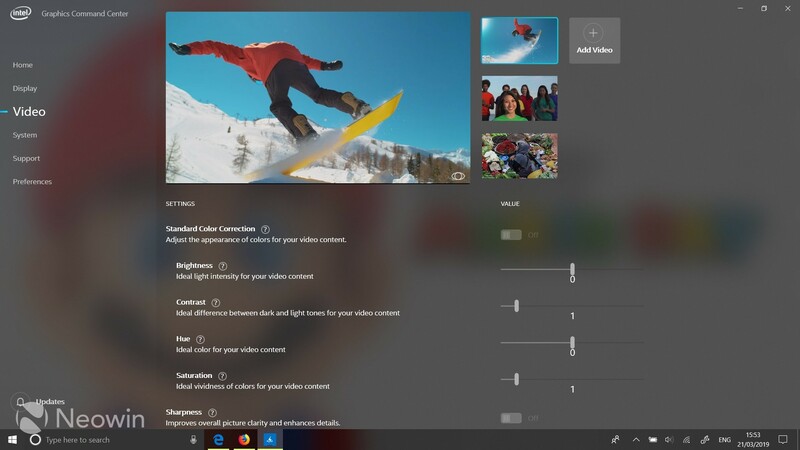 For video settings, image and color corrections are now listed in a single page with a few default profiles being offered, though it's also possible to create custom ones. This is the general theme for the entire app, with every part of the settings now being easier to get to and presented in a more friendly way. The app can even notify you about new driver updates if you install the Intel Driver and Support Assistant. 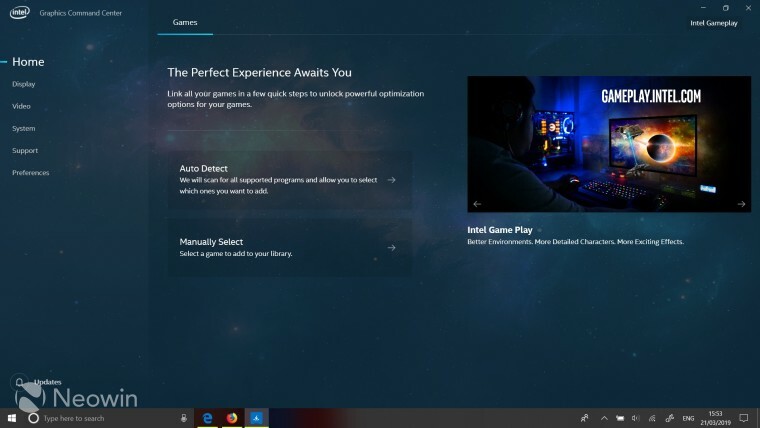 This new app is part of a broader effort from Intel to make life easier for those using its graphics cards, be it for gaming or content creation. If you're interested in helping shape "the future of graphics and visual computing", you can sign up for Intel's The Odyssey program here. 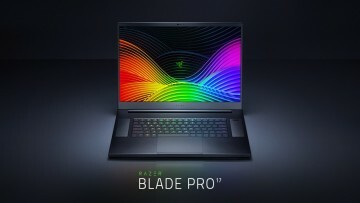 Intel is also planning to launch the 9th generation of H-series Intel Core processors in the second quarter of 2019, promising more improvements for gamers, such as the addition of support for Wi-Fi 6 for lower latency in online games. 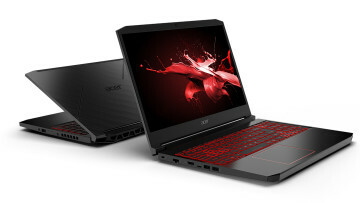 The company has also teased its first discrete GPU in a long time, and it's expected to be released next year. This effort to improve gaming on its platform is very likely leading up to that launch. If you'd like to try out Intel's new Graphics Command Center, you can download it from the Microsoft Store. 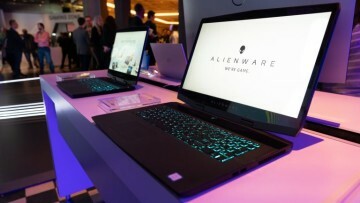 Intel notes that the software is still in early access, and that more features will be added over time. Presumably, once it's good enough, it will be installed automatically when you update your graphics drivers.